I’ve fallen hard for the whole Gucci Geek Chic style. Layering with texture creates visual depth. More is more as the fabulous Vix would say and that is what this Gucci Geek Chic style statement is all about. Don’t take off one item before you leave the house (Coco Chanel)…add three more! 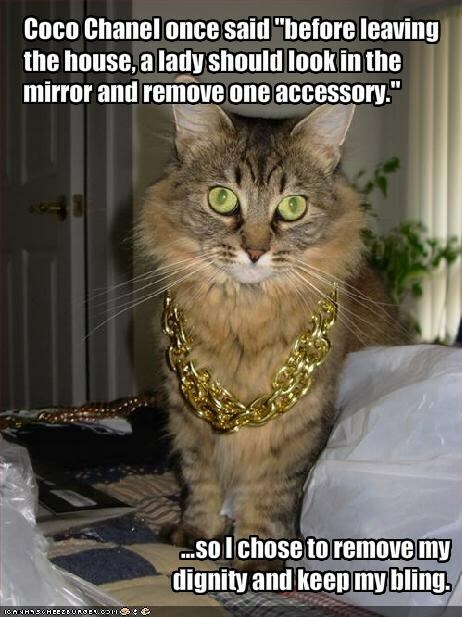 You’ll notice I’m not wearing any bling. I don’t need it. The textures and unique pieces are doing all the work for me. Looking at the photos now I think a fab pair of embellished nerd glasses might have been a nice touch. Fall is the perfect time of the year to layer with texture, visual textures (patterns) and fabric textures (material content). Paisley, silk, velvet, wool, leather and tapestry make up this eclectic vintage mix. Did you notice the visual trick with the proportions? Even though I’m only showing a little bit of ankle I still managed to elongate my legs. High waisted skirts with a tucked blouse or top are a short legged gal’s best friend. Well, that and a bit of a heel. These aren’t a very high heel, but they do the trick. 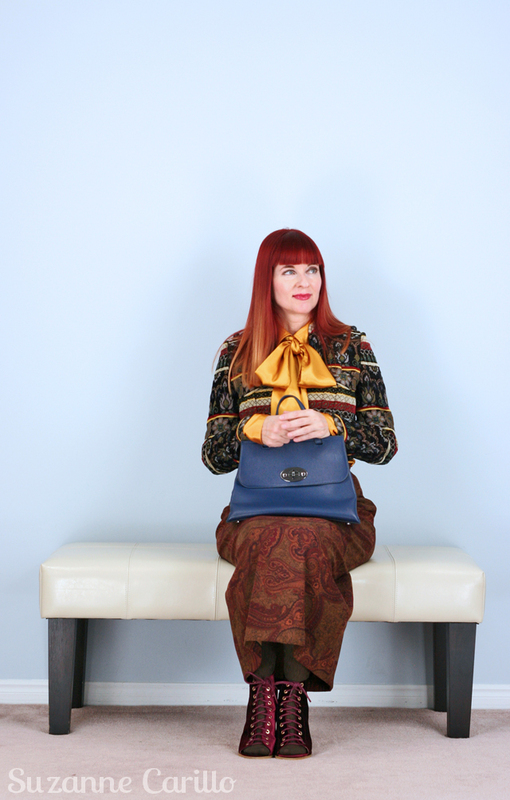 The blouse, skirt and jacket are vintage, the bag and shooties are contemporary. And yes…I’m wearing socks with my shooties. When I’m standing they read as boots to the eyes. When I look at these photos it reminds me of a Gucci version of Mary Poppins. I’m just missing my umbrella and hat. Mixing textures is such a simple and efficient way of creating visual interest, a walking collage and you’re the canvas. Learning how to “play” with your clothes is mentally stimulating and fun. There are no rules. You can do whatever you like. Challenge yourself. Be anything but boring. And just when you think you’ve gone too far…take it a little bit further. ohhh, lovely advice! and fabulous outfit!! I love all those textures, the pretty top and cute boots, and love particularly how everything works nicely. Such a brilliant and colorful autumnal vibe! I agree that playing with our clothes is one of life’s finest pleasures. I’m auditing your Advanced Class In Fashion here for exposure to advanced techniques but, honestly, I’m not grasping the concept. I need more foundation to understand it. Fabulous outfit! The colors are like made for you! More is always more! Thanks for the shout out and the gratuitous cat photo! How I love this outfit on you, that skirt is wonderful and thoroughly deserves to be accompanied by a wild print, gold satin, a killer bag and shoes to die for rather than the deadly dull”keep it simple” advice all those silly fashion mags preach! Textured pieces are so fun to wear! It brings so much life to an outfit! Love the choice of colors in this look! I love the references especially to Mary Poppins!! You really are being adventurous Suzanne, but it works fabulously!! And who wants to be minimal anyways (coco chanel)—it is all about having fun!! 🙂 How great is this?! This is such a wonderful look – so many different styles in great harmony. The bag is wow! Wow! Wow! YES! YES! YES! Awesome post Suzanne! I love your photos, your dialogue, your outfit. I would have given you four yeses, but there is no Zoë…sigh. Your legs do look a mile and a half long. When I try this, I feel just overwhelmed with clothing. grrrr. Maybe I just have never got the proportions right. I am such a fan of this Gucci chic style! The rich colors are awesome and I am so ready for fall temps here! I love the wine booties and the mix of patterns with so much richness. Looking fabulous! I am gaga over this look and you have done it with perfection! Love the boots, the gorgeous blue bag and mixed patterns and textures. The bow blouse. Yes, the perfect finishing look! 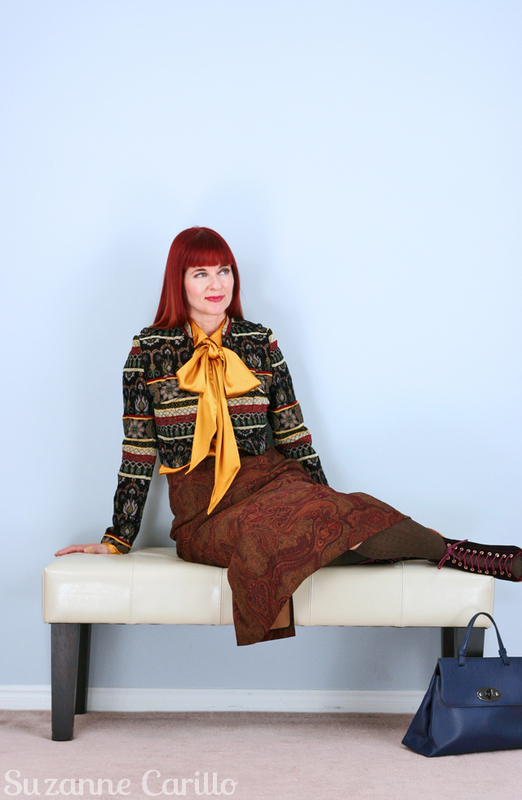 The rich look of Velvet and tapestry plus burgundy and ochre colours make a fantastic fall/winter outfit in Gucci’s style…well done, Suzanne!! You could be a modern (and very stylish) Mary Poppins if you had a carpet bag instead of the blue one. Your colouring is perfect for the autumn shades in this outfit. You look totally awesome in this outfit, and yes I’d like you to hurry up and return it as soon as possible! I’m just warming to the idea of autumn clothes and these confirm all that is good about the cooler weather. Velvets, brocades and lots of rich patterns all are waiting in the wings. It is inspiring to visit your blog Suzanne, as you’re such a maverick, always reinventing yourself and keeping us surprised with the next big thing. Brilliant, thanks! Ha, ha, Mary Poppins! Yes! Oh my, you do textures so blinkin’ brilliantly, Suzanne – you really are the Queen of Fabric mixing and my inspiration in this area. Bring on the velvet for Autumn. I love how you describe this look as Gucci Geek Chic. I want you in SPECTACLES – ALWAYS! Indeed, all these items work very well together. I would not have thought of throwing them together. You say that playing with your clothes is fun, but I always find it boring and hard work with little result. Isn’t that funny for somebody who loves clothes?